1989. Prince William Sound. Two young men in an overpowered skiff flying over the water to cover the biggest news story in the world. Not knowing what they’re doing, but faking it. Photographer Paul Souders and I learned a lot that summer of the Exxon Valdez oil spill, almost 30 years ago. The main thing we both learned is that the world is out there to capture on your own. You don’t need anyone to tell you what to do or show you the way. I became a freelance writer and author, but stayed in Alaska. Souders took his new knowledge much farther, doing truly astonishing things as a freelance photographer, working in 65 countries in the most extreme conditions. International awards confirm his reputation as one of the world’s best wildlife photographers. 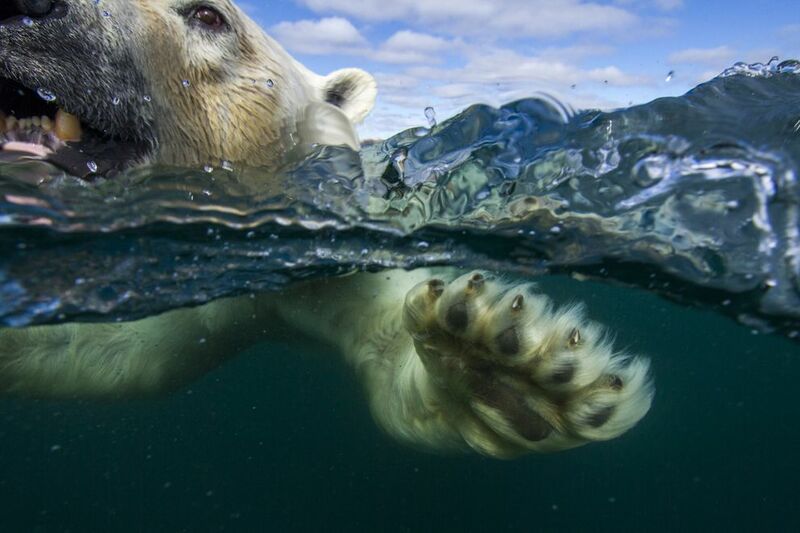 In 2013 he won the National Geographic’s photographic Grand Prize with a picture of a polar bear about to emerge from clear ocean water. The water’s smooth surface, surrounded by ice, bulges above the bear’s rising, furry head as the sun glows low on the horizon. 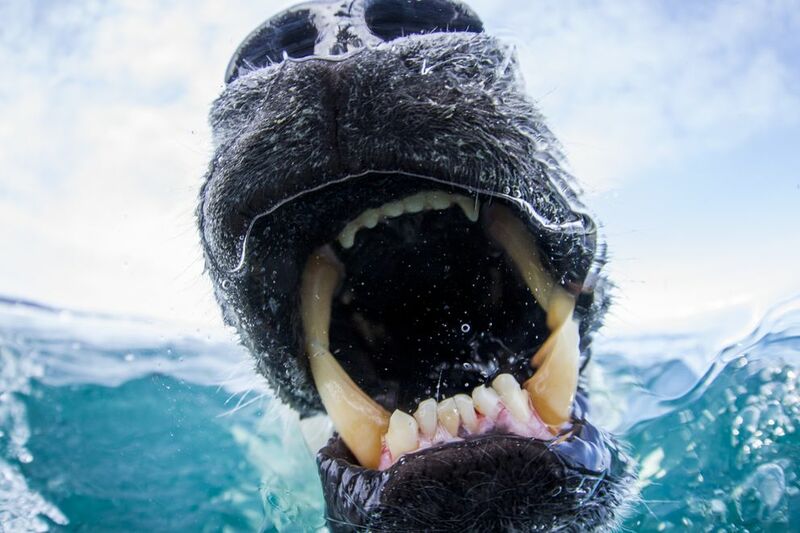 Souders took that picture from a few feet away while traveling, by himself, in an inflatable Zodiac dinghy with a 10-horsepower outboard motor, 30 miles from shore in the frigid, remote waters of Canada’s Hudson Bay. It was crazy. But it was far from the craziest thing he did. On one occasion, a polar bear popped his boat. In a new book, Sounders describes three years of solo voyages in the Arctic in search of polar bear images, a series of adventures told with humor and humility which nonetheless represent hair-raising acts of daring. I set my alarm before digging into “Arctic Solitaire: A Boat, A Bay, and the Quest for the Perfect Bear.” The next morning I hit snooze over and over. Souders had kept me up half the night. Souders and I had reconnected over an interview for my Outdoor Explorer radio show on Alaska Public Media. He hasn’t changed. He rarely misses a chance for a self-deprecating joke. I’ve never heard him brag. Nor does he seem driven or fearless. He is often afraid. But that doesn’t keep him from taking extraordinary risks. He started his photography career on credit cards, traveling into conflict zones to take pictures he could sell, including an incident in Haiti where other journalists were killed. The Anchorage Daily News hired him on the strength of those photos. Here we covered small town stuff like the Polar Bear Plunge in Seward (which did not involve polar bears). Life got more interesting when a tanker in the Sound caused America’s worst oil spill. The oiled animals and beaches were remote and tough to reach. Exxon had chartered almost every boat and airplane and drove rates out of sight. But Anchorage was in the midst of a newspaper war and the ADN was at the height of its powers and budgets. The editor bought a boat for the staff to use. I had spent some time on the water, but mostly in sailboats. Souders had no boating experience. We didn’t disclose that information to our boss. Instead, we opened up the 225-horsepower motor on the 17-foot Boston Whaler and looked for stories. We had plenty of adventures. I remember particularly when the boat broke down — entirely our fault — after we had landed on a heavily oiled island that had been designated a no-go zone by the Coast Guard. We broke rules, but our more significant risk was novice wilderness navigation miles from land in a tiny boat. We got lost. We bounced around in big waves. We slept in the rain. “We should not have lived this long,” Souders joked. But we got the stories. The boat allowed us to show up without warning at spill cleanup sites to see what was really going on. He made similar self-guided trips deep into wilderness all over the world. Photo agencies sold his work to publishers. Getting unique shots to sell meant going alone. In Africa, he once spent 27 hours digging his truck out of a mudhole with a cooking pot. The book is about his biggest adventure. 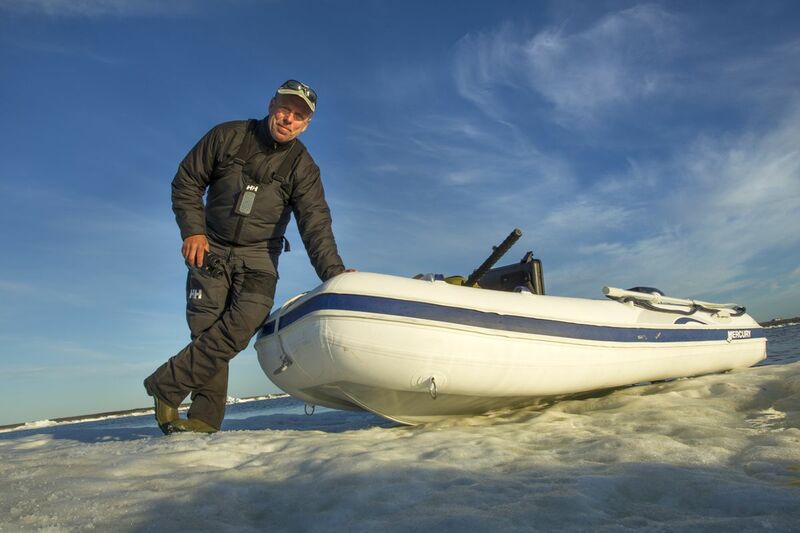 Souders decided to return to Hudson Bay with a larger boat, a 22-foot fiberglass C-Dory, named the C-Sick. It’s a weekend sportfishing boat familiar in Alaska harbors. The C-Sick had a cup holder. Sounders had already taken the boat where it was never intended to go, shooting photographs along Alaska’s coast all the way to Kodiak Island, across Shelikof Strait to the Alaska Peninsula, among the brown bears of Katmai National Park. He wasn’t sure how the Arctic voyage would work. Faking it, as we did in 1989, he put the boat on a trailer in Seattle and drove across the continent to a river that feeds Hudson Bay, launched at a makeshift ramp at a construction site, and shot downstream, bouncing over rocks, 85 miles to the ocean. From there, he went north, in search of the pack ice, more than 900 miles along tundra shores, with few spots sheltered from waves and fewer people, motoring slowly to extend his fuel. The stories are amazing, climaxing when the C-Sick became imprisoned in sea ice and, to save it from destruction, Sounders had to beach it on gravel, days from any help. Stranded there, the polar bears he had been pursuing began to pursue him. That was only one of many hazards he survived. He didn’t turn back. 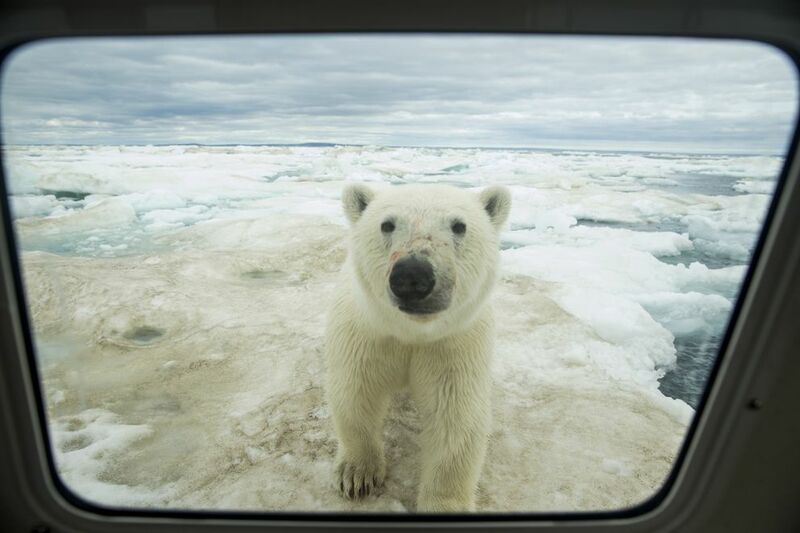 When the ice parted, he drove the boat back into it and got more amazing wildlife photos. Sounders has lived an extraordinary life. He didn’t ask permission.